Rob Kiser|Call Photo Miami East’s Macie Schaffner sets the ball as Lydia Conley moves into position. 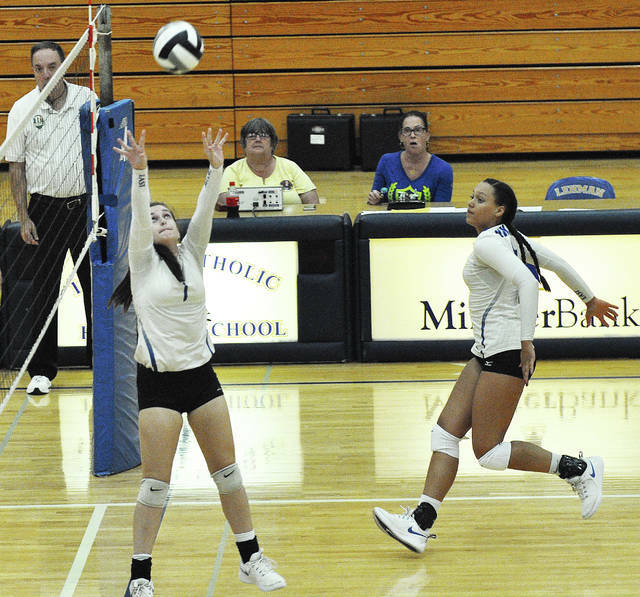 Rob Kiser|Call Photo Lehman Catholic’s Lauren McFarland digs the ball against Miami East Monday. Rob Kiser|Call Photo Miami East’s Delaney Bourelle goes up for a kill as Sophie Jacomet looks on. 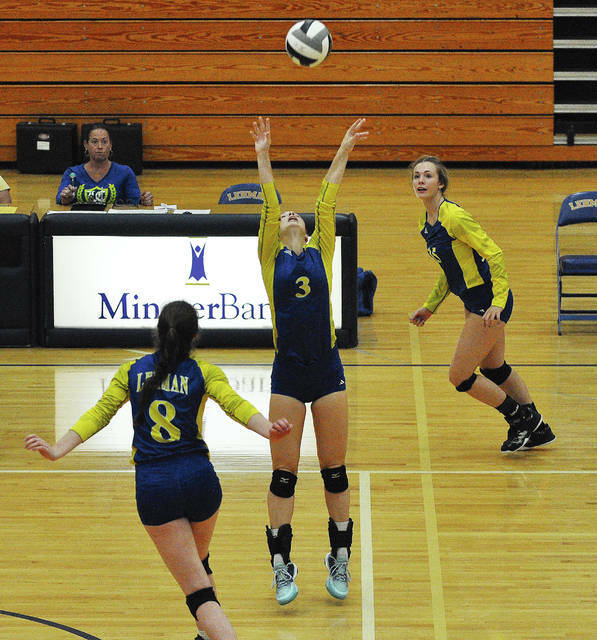 Rob Kiser|Call Photo Lehman Catholic’s Alexis Snipes sets the ball as Olivia Lucia (8) and Malorie Hussey move into position Monday against Miami East. It was a classic matchup between two of the most successful volleyball programs in the area. 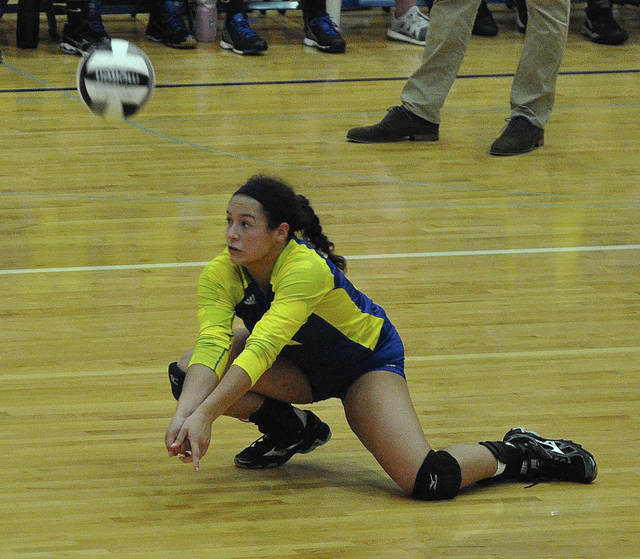 So, it should come as no surprise that it took five sets before Lehman Catholic emerged with a 20-25, 25-22, 25-15,19-25, 15-10 win over Miami East Monday at Lehman Catholic High School. Both programs have never hesitated to play the best in order to get better as reflected by their records. Miami East dropped to 13-8, while Lehman improved to 12-8. Between them, the two programs have combined for 11 state tournament appearances and six state titles. And in the race to 15 in the fifth set, it was Lehman who had the final pivotal momentum swing of the night. After a kill by Lehman’s Olivia Lucia tied the match at 9-9, Lauren McFarland stepped to the service line and instantly fired two aces — and added one more point to give Lehman a 12-9 lead. And it was a deficit East could not overcome. The Vikings cut it to 12-10 on a net serve, but Reese Geise had a kill, followed by two kills from Lucia on Abby Schutt’s serve to finish off the match. Miami East had led throughout the first set and won 25-20. Lehman had taken a 20-16 lead in the second set. But, Gretchen Frock served four straight points for East and Ashlyn Monnin’s kill put the Vikings in front 21-20. But, Lucia had a block and a kill and Malorie Husseyand McFarland added kills as Lehman went on a 5-1 run to close the set. Lucia began to take control at the net in the third set, as Lehman continued the momentum and rolled to a 25-15 win. Lehman again struggled to hit serves in the fourth set and when Sophie Jacomet had two serves including an ace, the Lady Vikings led 16-8. “Miami East did a good job taking us out of serve receive and we made a lot of mistakes,” Snipes said. Lehman got as close as 20-18 on two more McFarland aces and a Hussey kill. But, a kill by Lydia Conley for a sideout gave East a 23-19 lead and Frock served out the set. The match remained even until McFarland’s run at the service line in the fifth set gave Lehman the advantage they would not relinquish. For Lehman, Alexis Snipes dished out 51 assists, while Lucia had a huge match with 31 kills and nine blocks. McFarland had 10 kills, five aces and 21 digs; while Reese Geise had seven kills and Abby Schutt and Hussey had five kills each. Pyper Sharkins had nine digs. Jacomet had 17 kills and 22 digs for East, while Nichole Hood had 11 kills and 15 digs. Monnin had eight kills and one ace, Conley had eight kills and three blocks and Delaney Bourelle had three kills and one ace. Frock dished out 33 assists and Macie Schaffner added nine. Gabrielle Hawkins led the defense with 23 digs and Lauren Fisher had five digs and one assist. Lehman will close out the regular season hosting Temple Christian Thursday and playing at Urbana Saturday; while Miami East hosts Covington Thursday to close the regular season. Before both prepare to go deep into the postseason — which has become a tradition. https://www.dailycall.com/wp-content/uploads/sites/30/2018/10/web1_macie4.jpgRob Kiser|Call Photo Miami East’s Macie Schaffner sets the ball as Lydia Conley moves into position. 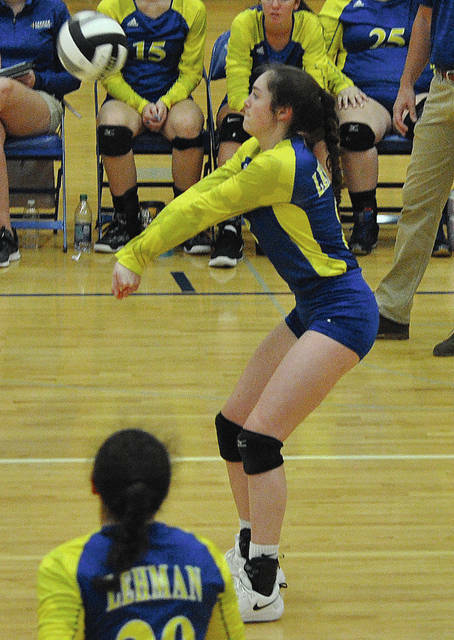 https://www.dailycall.com/wp-content/uploads/sites/30/2018/10/web1_lauren.jpgRob Kiser|Call Photo Lehman Catholic’s Lauren McFarland digs the ball against Miami East Monday. 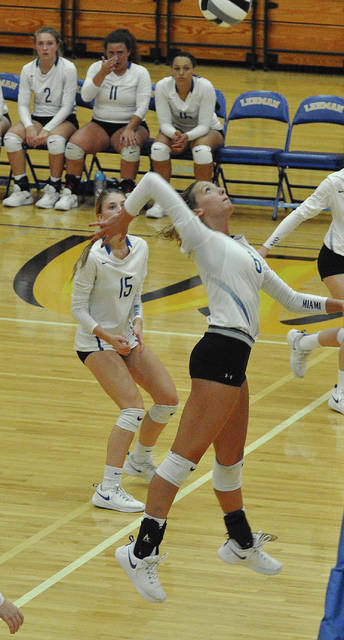 https://www.dailycall.com/wp-content/uploads/sites/30/2018/10/web1_east6.jpgRob Kiser|Call Photo Miami East’s Delaney Bourelle goes up for a kill as Sophie Jacomet looks on. https://www.dailycall.com/wp-content/uploads/sites/30/2018/10/web1_alexis.jpgRob Kiser|Call Photo Lehman Catholic’s Alexis Snipes sets the ball as Olivia Lucia (8) and Malorie Hussey move into position Monday against Miami East.